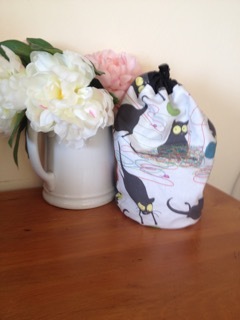 Many thanks to Sarah for sharing these wonderful photographs of herself and her Kipster knitting bag on their travels. On top of Mt. Oberg in MN with a view of Lake Superior. Outside a knitting shop in Iceland. Zoe's Bags in New Zealand! TANIA'S BAGS IN NEW ZEALAND AND A DESCRIPTION OF THE LOCATION! 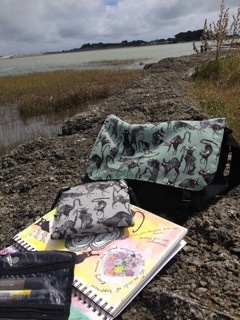 This is a shot of my Lynx Deluxe (portable art studio) and my Squirrel (faithful wallet, notebook, keys, and phone carrier) out at the Manawatu Estuary. This place is listed as a Wetland of International Importance. I was there to see (and do some sketching) of the Bar-tailed Godwits which fly all the way from Siberia to New Zealand to escape the winter. Thats a flight of 11,000-12,000 km which takes them an average of 8-9 days! 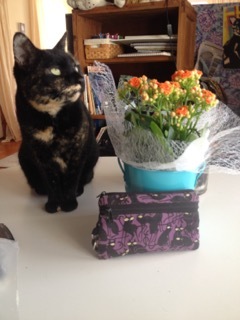 And this is my Sweet Pea (with Grabby the cat), still going strong and it keeps all my access cards organised and lives most of the time in the car. This is my SueBee, such a versatile bag. Before you made me the Lynx I used it for small sketching supplies out and about. Now it comes to work with me holding all those essential bits and pieces.